Editor’s note: To tell the city that you want a more progressive transit plan for East Colfax, get heard by submitting your comments to Denver Public Works. The plan to build “bus rapid transit” on East Colfax is a step in the right direction that will make transit faster and more appealing on Denver’s busiest bus route. Problem is, the new bus lanes won’t be physically separated from traffic, and bus riders won’t see the improvements for at least five years. That’s the takeaway from a public meeting Wednesday night where Denver Director of Transportation Crissy Fanganello and reps from Denver Public Works told residents how they want to move more people by prioritizing buses. “What we’re seeing is an opportunity to move a lot more people than we could move in the number of cars, and that’s what we’re really looking for,” Fanganello said. RTD’s 15L moves about 22,000 people per weekday right now, while the upgraded version could move 50,000 according to transit planners. The idea of upgrading bus service on Colfax has already been kicking around for a decade, and it will be at least five more years before Denverites will see the improvements. Transit planners still have to secure funding, get public feedback, and clear federal red tape. For comparison, Mexico City built about 30 miles of true BRT in five years. Bus lanes. A bus-only lane will replace a travel lane on each side of the street for about five miles between Broadway downtown and Syracuse to the east. The bus lanes won’t be physically separated from traffic, however, since they’ll run between a general traffic lane and the parking lane. They also won’t be in effect outside of rush hours. 5-minute headways. Buses will arrive every five minutes, about double the frequency of current peak hour service. Off-board ticketing. Passengers will buy fares off the bus, saving passengers a lot of time by speeding up the boarding process. Better stations. Planners envision 20 new, well-lit, comfortable bus stations with real-time arrival information. Some stations will be built on extensions of the sidewalk (“bus bulbs”) so buses don’t have to pull in and out of traffic. Platform-level boarding may or may not happen. Traffic-signal priority. Every intersection along the route will have traffic signals that prioritize buses. This may mean that a light stays green longer if a bus is approaching, or the light could turn green preemptively, as the bus approaches. Add them all up, and these changes should make a significant difference. Still, the bus lanes come up short compared to BRT systems in Mexico City, Bogota, or Brisbane, which have busways fully separated from other traffic. The Colfax proposal seems more like New York’s Select Bus Service, which doesn’t make the cut as true BRT according to the Institute for Transportation and Development Policy’s scorecard. Think Broadway and Lincoln, which have a painted bus lane and signs with blinking lights that politely ask drivers to steer clear. No word yet on how the bus lane will be enforced — New York uses cameras — but one consultant said it will be worked out after the conceptual stage. The bus will run along the street’s right side, not in the center lane, which ITDP prefers so that cars interfere less with buses. While the Colfax project will claim some street space for transit, it’s still a tentative step compared to what other cities are doing. Especially when you consider how little priority is devoted to transit on the whole street network. Of the five streets parallel to Colfax’s main drag, four are three-lane, one-way speedways in and out of downtown. It’s sounding like the Colfax BRT line will be more like the Swift “BRT” in the Seattle-Everett metropolitan area. I would prefer it be full-fledge center-lane BRT, but this is still a substantial improvement over existing options on Colfax. I would put the pressure on RTD to implement level-boarding. The big issue that I have with this proposal is the “maybe, maybe not” on level-boarding. Center lane operation may be too difficult to implement on Colfax since it is only five lanes (two each way and a the turn lane). To do it you would have to remove some parking and I for one prefer walking next to parked cars (or a bike lane) rather than a travel lane whatever the speed limit. On a side note, one possible reason that it is stopping at Syracuse is that Aurora was not interested in any changes. Neither streetcars nor BRT, even the watered down version. Not surprisingly, the loudest voices are those bemoaning congestion and overflow traffic. We need more people to support a bold vision which truly prioritizes transit. If you haven’t yet, please submit your comments here in support of robust BRT- https://trackvia-customer-documents.s3.amazonaws.com/documents/26419/forms/EBA_WK5KqCLn94/Comment_Form.htm. exclusive 24/7 is not completely off the table. 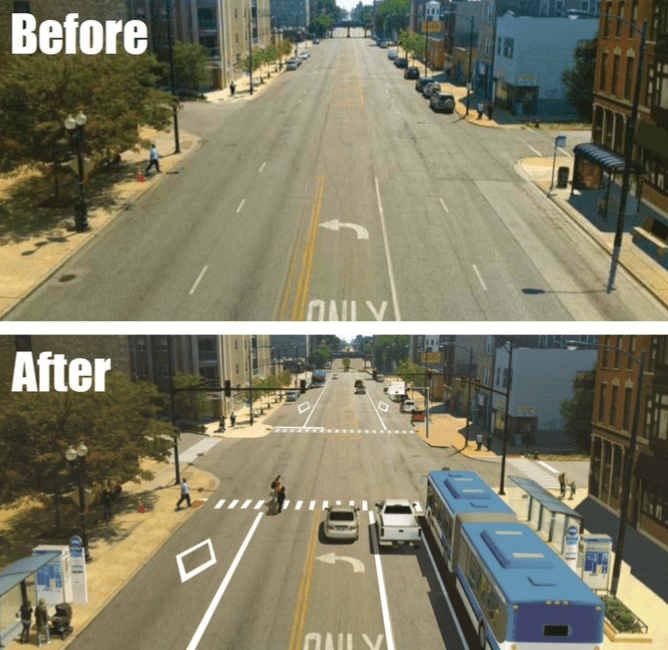 Permanent bus lanes would allow design elements that improve visibility and awareness and make a statement that transit is not second class on the corridor. Overflow traffic is a real issue in that neighborhood—I lived at 14th and Elizabeth for a year, and in that time I personally saw four car crashes at that intersection. There’s also a lot of crazy drivers on 16th as well, particularly around weekend brunch at Denver Biscuit Co. This isn’t so much of a BRT issue—the city should have dealt with this already, doing things like adding speed bumps to side streets and removing selected parking spots along 13th and 14th to reduce accidents and make the neighborhood more pedestrian friendly. Speeding is often caused by streets being too straight. The problem I see at this intersection, both before and after, is the big yellow striped area beyond the intersection. IT should be divided in two and have car traffic on it. The space would be better used widening the sidewalks. This would eliminate the straight shot the road presents to the driver. Make the lanes 24/7 not rush hour, people travel Colfax at all hours. The planners need to be far less tepid. 5 years is a travesty. Cars should be illegal. proposed Colfax service can be so described (honestly).